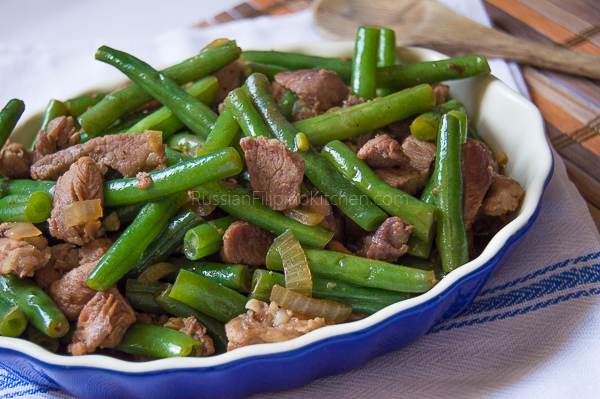 Slice green beans in half or about 2½ inches length. Peel and chop onion. Also, peel garlic and mince. Slice pork into strips into ½ inch thick. Heat up a large wok or skillet over medium high heat. Add 2 tbsp oil and saute pork until browned. After about a minute, add salt. You'll notice the meat will release some moisture. Cover skillet, turn heat down to medium low, and simmer until pork is thoroughly cooked for 10-15 minutes. You may have to add more water as needed, ½ cup at a time until the meat gets tender. As soon as the water has evaporated and meat has browned, adjust heat to high and add the rest of the oil. Saute onion and garlic until fragrant (garlic must be browned a little and onions become translucent). Throw in green beans and saute for a minute. Add soy sauce, ground black pepper, and water, then stir to mix. Cover skillet and cook for 4-5 minutes until beans are crisp-tender.